The What: Middle Atlantic Products is now stocking and shipping the High Power DC Distribution solution, solving the installation challenges posed by powering a high density of DC-powered components with similar voltages. The What Else: Part of the DC Power Distribution family, the new 200W and 300W models provide high current capacity to a high quantity of outputs—up to 24 devices—maximizing the same voltage in a single unit, 5V, 12V, or 24V, or splitting between 12/24V. 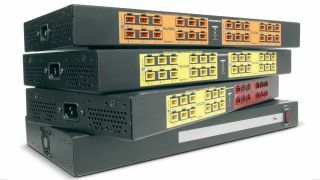 "When we introduced the DC Power Distribution family two years ago, for the first time we made it possible for integrators to install the growing number of DC-powered small devices easily in a rack and reliably power them," said Scott Lowder, director of product management for power at Middle Atlantic. "Since then, our customers have anxiously awaited models that would meet their higher power and density system demands. With these new solutions, customers can solve every power requirement that comes their way." The Bottom Line: As devices and applications shrink in size, technology professionals must maximize utility of every AC outlet available, especially in European applications. Middle Atlantic Products' DC Power Distribution solutions gives AV consultants, integrators, and installers access to a broad DC power distribution portfolio. They not only remove messy, space-consuming, unreliable wall warts from the design and provide maximum power to support, but they also increase system efficiency, which saves energy and reduces heat generation. The new 200W and 300W models deliver the same features as the family's 45W DC compact and 125W DC 1-RU systems, eliminating power-cabling clutter caused by the growing number of small devices. The solutions' reliable multilevel protection on both AC input and DC outputs and built-in individual redundancy ensure maximum uptime. The multimount design can be installed in an available 1-RU space or at the back or side of the rack for zero-U mounting, providing ultimate installation flexibility. A supported input voltage range of 100-240VAC, 50/60 Hz provides additional design flexibility for international applications.